Gov. 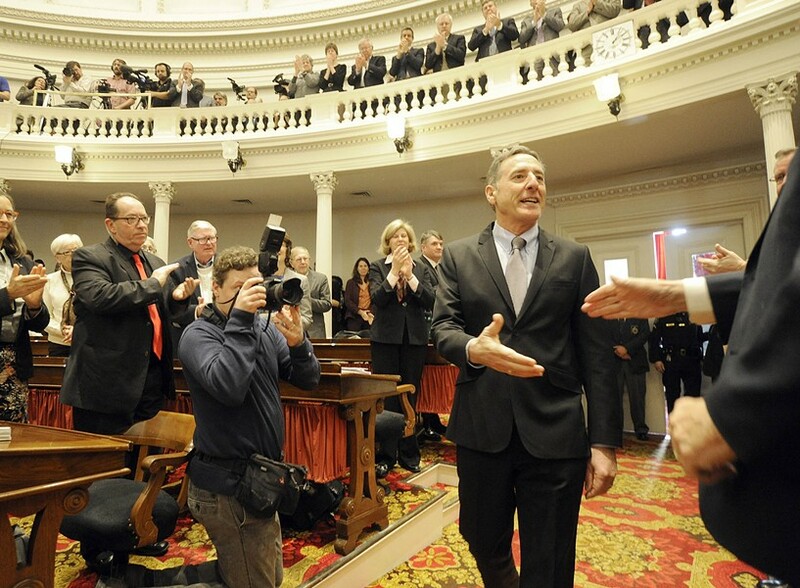 Peter Shumlin arrives for his State of the State address in January. Updated June 6, 2016 at 7 p.m.
Gov. Peter Shumlin on Monday vetoed a renewable energy siting bill — a decision that will bring lawmakers back to Montpelier on Thursday. What might happen then? That’s not quite clear. While some lawmakers are pushing to override the governor’s veto, others — including House Speaker Shap Smith (D-Morristown) — want to pass a new bill, pledging that will take just a day. The bill, S.230, was designed to give local communities more say in the siting of solar and wind projects. The bill led to a long and difficult tug-of-war between those who want more renewable energy in Vermont and those who’ve found wind and solar projects to be obtrusive neighbors. It was finalized in the last hours of the legislative session. Shumlin argued in his veto message that last-minute changes made to the legislation would inadvertently halt commercial wind development in Vermont after he has spent the last six years trying to beef up the renewable energy supply. “Signing S. 230 as drafted would take us backwards and take an important renewable energy technology off the table,” Shumlin said in his veto message. Members of the House and Senate, which adjourned for the year in May, plan to return to Montpelier at 10 a.m. Thursday for a one-day session. But leaders of the two chambers are sending different messages about their goals. Smith said he thinks legislators can and should pass a new bill that addresses Shumlin’s concerns. He said there’s not enough support in the House to override Shumlin’s veto, and that he does not support doing so. “My feeling is that this can be easily fixed,” Smith said. Meanwhile, Senate President Pro Tempore John Campbell (D-Windsor) said he’ll ask his members to vote to override the veto, which would require a two-thirds majority in both chambers. Campbell said he’s dubious that lawmakers could agree on a new bill in just one day and he argued that changes can be made next year. He noted that it costs taxpayers $60,000 a day in legislative pay and expenses for lawmakers to return. Smith acknowledged that he and Campbell have different views, which could make it tough to finalize new legislation in one day. But that’s what Shumlin will be pushing for. Speaking at an unrelated press conference in Milton on Monday afternoon, the governor said he’s been working with legislative leaders on a proposed fix for the bill. “I’m not expecting the veto to be overridden,” Shumlin said. Lawmakers achieved a hard-fought agreement on the legislation, he said. Lt. Gov. Phil Scott, a Republican candidate for governor, sent a letter Monday to legislators arguing that any new bill in the works should be disclosed immediately so the public can weigh in. “Otherwise ... I would recommend you override the governor’s veto,” he wrote. While there might not be enough votes to do so, there could be enough to block the suspension of rules needed for both the House and Senate to pass a new bill in one day. Minority leaders in both chambers said they won’t support anything that weakens the original bill. House Minority Leader Don Turner (R-Milton) and Senate Minority Leader Joe Benning (R-Caledonia) said they will refuse to suspend rules to allow a new bill to reach a vote. Turner said he would rather start over next year on a new bill than pass a weakened one this year. Shumlin cited four key issues with the bill that he said stemmed from late changes. Smith said he agrees with Shumlin that those issues could cause problems. Turner said, however, that legislative lawyers issued him a legal opinion that differs from Shumlin’s interpretation. The lawyers have assured him, Turner said, that the bill could be enacted without the consequences Shumlin outlined. By calling for “emergency” rules to establish new sound standards for wind projects, the state would be incorrectly declaring turbine noise a public health emergency, Shumlin said. That’s a precedent the state does not want to set, he said. Shumlin also argued that a provision in the bill requiring notice of certificates of public good to be filed with land records could create problems for solar customers selling their homes. He also noted that lawmakers left out the $300,000 in funding. I have carefully reviewed S. 230, which is a bill designed to give communities more say as we plan for our renewable energy future together. The core of this bill is something I strongly support and desire to see move forward. S. 230 was finalized very late in the legislative session, and unintended changes were made at the last minute. After consulting with legal experts at the Public Service Department and the Public Service Board, I have determined that in a few critical instances the language in the bill does not match what I understand to be the intent of the Legislature. There are four issues with the bill that need to be fixed. First, in seeking temporary rules for new wind sound standards the bill unintentionally invokes a provision in 3 V.S.A. 844(a) that would make Vermont the first state in the country to declare a public health emergency around wind energy, without peer-reviewed science backing that assertion up. Second, in setting a ceiling for new temporary wind sound standards, the bill unintentionally relies on a standard used in a small 150 kilowatt project as the standard for all wind, large and small, going forward. That standard, a complex and variable formula that would require no sound higher than 10 decibels above ambient background, could have the clearly unintended effect of pushing wind projects closer to homes where the background noise is higher. In addition to these two problems, a third concern is a provision in the bill requiring notice of certificates of public good to be filed with land records, which could create problems for residential solar customers when they go to sell their home. Finally, $300,000 in planning funds for communities was unintentionally left out of the bill. I believe that taken together, the emergency declaration and the restrictive sound standards will make it impossible to continue to sensibly site renewable wind power in Vermont. Through the policies passed by this Legislature, we have made great progress on building renewable energy. We have created 17,700 clean energy jobs which represents 6 percent of the Vermont workforce and makes us the highest per capita on clean energy jobs in the nation. Signing S. 230 as drafted would take us backwards and take an important renewable energy technology off the table. I cannot support that action, and therefore I am vetoing S. 230. I believe, however, the limited number of issues identified in the bill can and should be remedied by the Legislature during a veto session scheduled for June 9. My Administration will do whatever we can to assist the Legislature to make the fixes necessary to produce a bill that I can sign.